Why have we normalised slaughter? Not a day goes by now without us reading or watching news of some act of violence carried out by states or anti-state actors. Just this week, the world was rocked by the terrorist attack in Manchester in Britain. Yet as the scholar of religio-political violence Olivier Roy has noted in his latest work Jihad And Death, the phenomenon of the present-day militant is wholly modern. Roy notes that the appeal of such movements lies in the culture of popular casual violence they promote and glorify, and how they valorise the individual to the point where rage against the system and all of society becomes the cardinal point of self-determination. For many of these militants, entry into the world of violent nihilism was not through the door of scripture or religious praxis - indeed many of the militants he studied were hardly religious throughout their lives, and had only belatedly rediscovered the vocabulary of religion before they moved on to actual acts of terrorism. Rather, most of them found themselves in the world of underground fight clubs, mock combat tournaments and violent video games. Roy's argument is an important one for several reasons: First, he effectively decouples violence from religion and argues that it is not religion that makes a person violent, but rather it is violence that is now being given a religious veneer. Second, he shows that this cult of popular casual violence permeates all modern societies and that it affects communities all over the world, of different religious backgrounds; and so no single religion can be blamed for it. And third, he locates the problem at the very heart of modern society today where people feel that their lives are increasingly meaningless and insecure. Through the ages, human beings have needed affirmation and a sense of self-worth. In itself, having such feelings is certainly not problematic, and some may argue that it is natural to feel thus, and essential for anyone's sense of well-being. But in the world of violent gaming and violent entertainment, such needs are easily fulfilled - via digital acts of violence and virtual achievement - and the rewards are instant. Roy's observation about how violent video games and stories serve as the background to the formation of such radicals is instructive. In the world of violent video games - and frankly we should admit that almost all video games and movies these days are violent and sensational in nature - violence itself is the goal and purpose of the game. In most games people play these days, killing others, beating up victims, destroying the homes and cities of enemies, are the goals of the game itself. I have hardly ever seen games where one can win without vanquishing some imaginary enemy or another, and upping the ante further is the rise of games that are increasingly bloody and realistic. In an instance of not seeing the wood for the trees, we tend to be appalled at the singular acts of violence carried out by radical political and religious groups whenever they are reported in the news, but forget the fact that immediately after the news we may well be watching a programme or playing a game where hundreds of people are slaughtered as entertainment. The irony is not lost to those who promote such violence in the first place, and is all the more critical in societies like ours where violence is seen as a distant, yet fascinating thing. To bring the issue closer to home: All Asean citizens who were born after the formation of Asean in 1967 have, to some extent or another, benefited from the peace dividend that was the result of the formation of the Association of South-east Asian Nations. As scholars like Professor Kishore Mahbubani have noted, one of Asean's greatest achievements over the past half a century is how it has managed to prevent war in our part of the world and ensured an enduring peace for all the citizens of the region. The net result of this has been at least two generations of South-east Asians who have never experienced violent conflict at first hand, and who do not have a tactile memory of what war entails, or its miseries and deprivations. None of us born in South-east Asia after 1967 can recall the horrors of the Second World War - the bombings, street-to-street fighting, prison camps and death marches - and none of us has suffered the trauma of war. Even at the height of the Cold War and the war in Vietnam, violence in the region was confined within states, and certainly did not spill over to the founding member-states of Asean. This also means that for at least two generations of Asean citizens, war and violence are distant, abstract concepts; something that happens far away in countries that seem far and foreign to us. The work of researchers like Roy shows clearly how pop violence serves as the doorway to other forms of more radical and dangerous violence, and we cannot hope to deal with the problem of modern-day radicalism as long as that door remains open. We may view such violence on television or read about it in the news, but such instances of violence may not have any direct relevance or impact upon us. Consequently, we have grown somewhat parochial, cloistered and over-protected, and we take our peace as a given. Set that against the wider context of a connected globalised world today and one that is characterised by all forms of sensationalism dressed as entertainment, and we end up with a distorted understanding of reality altogether: We watch war movies, play war games and indulge in gory entertainment on a daily basis with no understanding of the human cost and the emotional damage that violence brings with it. When we look at the profiles of captured radicals or those who later surrendered themselves to the authorities, a similar and predictable narrative emerges: They confessed that they had little idea of what they were getting themselves into, and had no conception of what war was really like until they found themselves in the midst of it, by which time it was obviously too late. 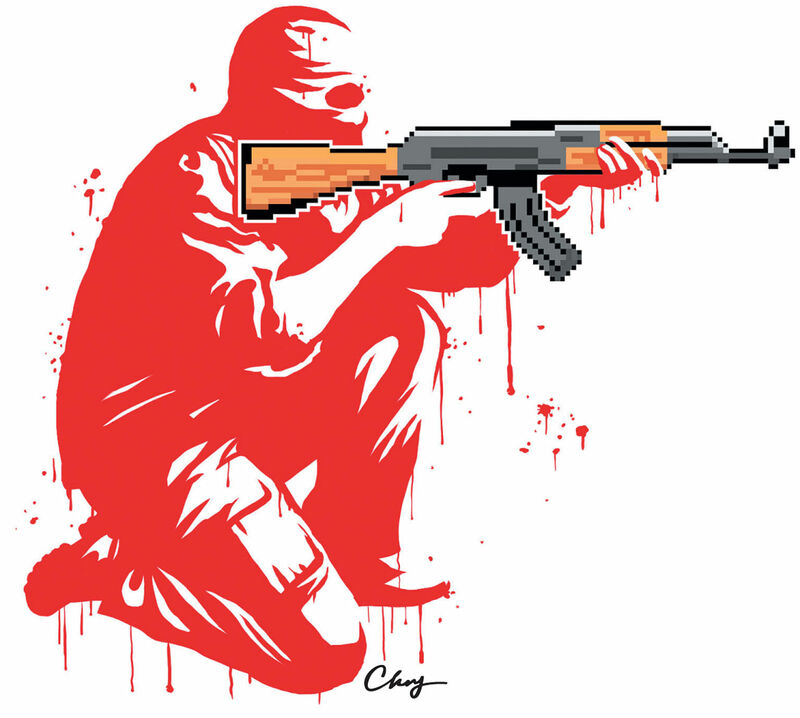 To return to the argument of Roy, we need to seriously consider the linkages between normalised, routine violence dressed as games and entertainment and the more sinister world of real-life violence in the socio-political domain. When Roy drew the connection between violent gangs, criminal activity and violent entertainment to militant radicalism, he was showing how the boundary between the two domains is truly porous. The danger is amplified when those indulging in such gory entertainment happen to be inexperienced individuals who have been exposed only to glorified violence and never felt the real human cost of conflict. But we also need to open up new pathways to social engagement and human agency that restore meaning and purpose to the lives of people as well. This would be a task that involves all sections of society, from families to educational institutions, the state as well as the media and entertainment industry. But we need to begin by addressing the problem of normalised and popular violence in our societies today that finds expression in the world of entertainment and gaming. As the saying goes, we cannot have our cake and eat it; and likewise we cannot continue to promote a culture of violent entertainment while complaining about the rising level of violence all around us.